I desperately needed an editorial calendar. A real one, anyway–my scribbled notes and dates were becoming too disorganized, especially when I wanted to plan for bigger blogging projects. I spent a lot of time googling templates to create a system that would work for me, but there only appeared to be two options: printable calendars (which wouldn’t be much better than my previous scribbled-list system) and Excel (of which I am NOT a fan). Using the app hadn’t occurred to me, since I prefer hard-copy calendars for real-life stuff, but my eyes fell on the little calendar symbol in my MacBook’s dashboard and that proverbial lightbulb above my head flicked on. It’s super easy to move stuff around: just drag and drop. For instance, I planned to publish this post yesterday (as shown in the screenshot above), but real life happened so I dragged it over to today and moved Wednesday’s post to Thursday. It’s color-coded. At a glance, I can easily distinguish between posts, Twitter chats, social media, and other blogging-related activities. I don’t have to see everything all at once. 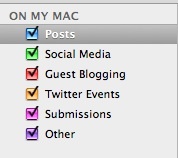 In the checkbox on the side, I can choose to only see planned posts or social media plans. No more getting overwhelmed. I don’t have to do everything manually. This is mostly applicable to Twitter events, but also works for series posts. Just tell the app to repeat the event every day, week, or month, and it automatically adds them to the calendar. I can easily get rid of the excess. If one week I don’t participate in #MondayBlogs (like this week–like I said, real life happened), I can just delete that from the calendar after it’s over. Once I promote a post or submit my writing or photography elsewhere, I can delete that event too. What’s left is a record of what posts I’ve published and when. I can make a to-do list alongside my monthly calendar view. It matches my color-coding system (yay consistency! ), can be ranked by priority or date added, and allows me to check things off as I complete them. This function is extremely important to me, since a lot of the blogging work I do isn’t time-sensitive but needs to be written down somewhere. Of my 13 winter break goals, I furthered or completed 12. Some were smaller, more concrete items, and others were reminders to work on larger projects. Now that I have the organizational tools to prepare for the future, I can get ahead of myself in a way that I couldn’t do with my old scribbly method. Thank goodness for that proverbial lightbulb. I should really try and use some sort of editorial calendar. I’m fine with posting & commenting all willey nilley with I’m not swamped, but my blog is the first thing I drop when I get busy. I’ve never been awesome at managing time. I too am not a fan of Excel. I’ve tried again and again. I just hate it. Exactly–it’s easy to drop posting if you don’t have a plan. I find I feel less inspired when I’m busier, so if I already know what I want to write then I can spend 20 minutes here and there drafting. I think I would like Excel if I understood it, but every time I’ve tried to learn I just get overwhelmed. Plus, I don’t need spreadsheets often enough to stay up with it. I should really make an electronic calendar. I have approximately 5 different paper ones floating around at the moment! I used to do that too! I still use the notebook and random sticky notes but the electronic calendar synthesizes all of those. I’ve never used google calendar, but I don’t need to because of iCal (I love my Mac). The only way I think it could get better is if it synced to my phone or I had a way to access it from other computers, which I know is a perk of google calendar. I also tried to use google calendar, and it doesn’t really work out for me. I don’t have a MAC so I guess I’ll stick with a planner for now :/ But this just makes me even more excited to get a mac ! I love all the software already installed on the Mac! It makes my life so much easier. Planners are okay too, but I change my mind so often that I was spending so much time scribbling & recopying my plans that it was a waste. I generally prefer handwriting to typing too, and I think a dry erase board would also have solved my problems, but I move around so often that it becomes less functional. It certainly works for me–you should see if it works for you!